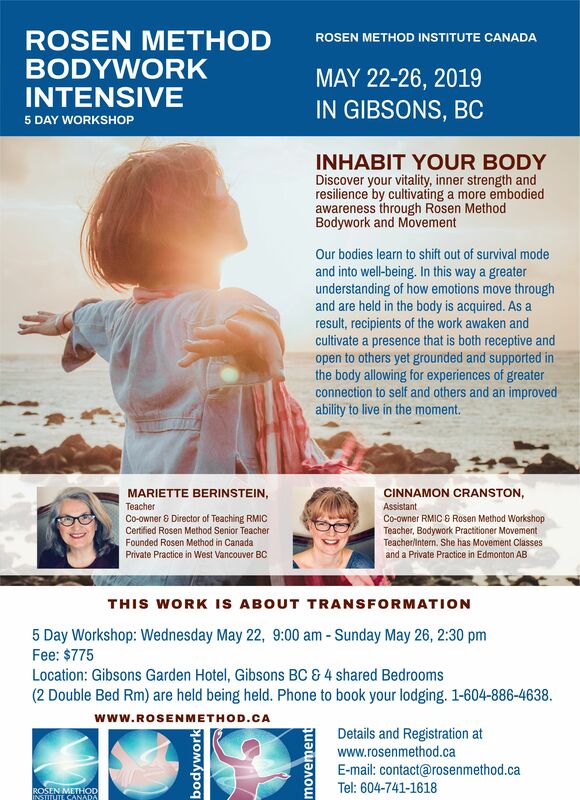 May 22 – 26, 2019, in Gibsons, BC. Discover your vitality, inner strength and resilience by cultivating a more embodied awareness through Rosen Method Bodywork and Movement. Our bodies learn to shift out of survival mode and into well-being. In this way a greater understanding of how emotions move through and are held in the body is acquired. As a result, recipients of the work awaken and cultivate a presence that is both receptive and open to others yet grounded and supported in the body allowing for experiences of greater connection to self and others and an improved ability to live in the moment. Fee: $775 Location: Gibsons Garden Hotel, Gibsons BC & 4 shared Bedrooms (2 Double Bed Rm) are held being held. Phone to book your lodging. 1-604-886-4638. Rosen Method Bodywork is a unique form that uses a listening touch, both present and responsive, along with affirmative words to invite deep relaxation and self-awareness in the body. This is an effective way to access your vitality and inner resilience, as your body awakens and shifts out of survival mode and into wellbeing. Rosen Method Movement re-awakens your capacity to move with more ease and to inhabit yourself with awareness and with self-compassion. Rosen Method Movement will help you discover patterns of tension and habits of movement that have been causing pain or limiting your potential the effect is restorative and liberating! Mariette Berenstein, Certified Senior Teacher, President, COO of the Rosen Method Institute Canada Inc. With over 18 years experience Mariette has a deep appreciation, an understanding and awareness of this compassionate, gentle, transformative work and that has created the foundation for the school, her teaching, and private practice. Mariette Berinstein began her journey in 1989 with Elaine Mayland and Marion Rosen (Founder). In 1995 she became a Certified Rosen Method Practitioner. She studied with Paula Kimbro; became a primary supervisor. 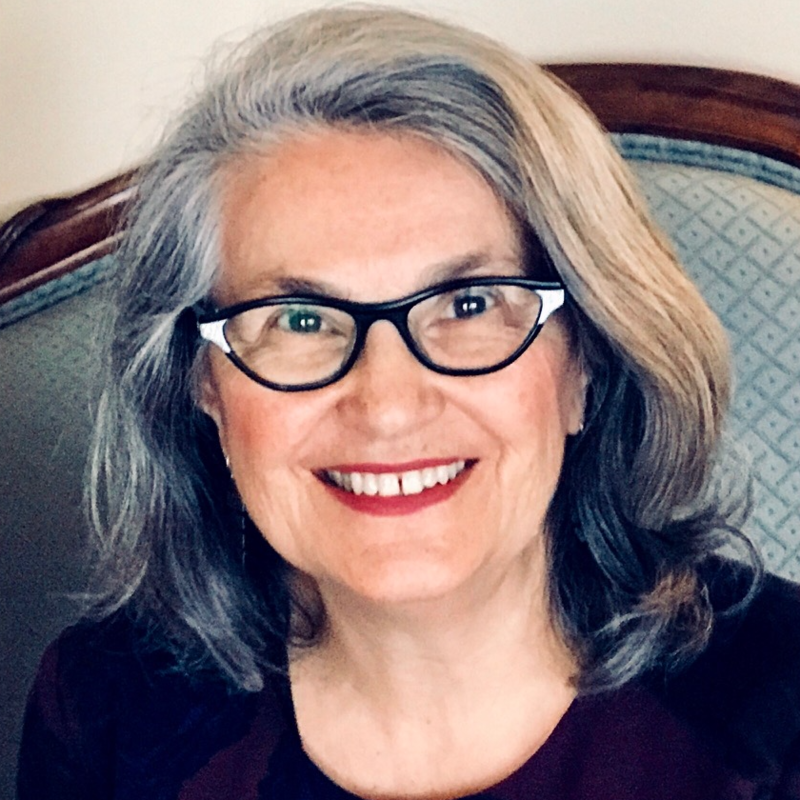 In 2003 Mariette studied with Bill Samsel completing her Rosen Method Teacher Training Programs (Certified Workshop Teacher, Teacher and Senior Teacher) completing in 2010. School Owner since 2005, she developed the Rosen Method training programs. Cinnamon Cranston has been in the health and wellness field for 20 years. Cinnamon began her career as a massage therapist graduating from Mount Royal College in Calgary. She has also received training in Level Two Reiki and Neuro-Linguistic Programming(NLP). 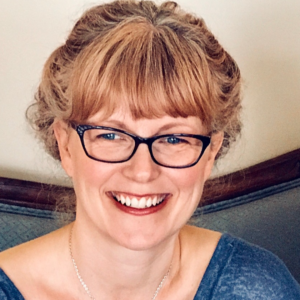 Cinnamon now specializes in Rosen Method Bodywork and Movement and is a certified Rosen Method Bodywork Practitioner and Workshop Teacher as well as a Rosen Method Movement teacher/intern with a private practice in Edmonton, AB, Canada.